Large, two room corner suite with no closing door between the rooms, instead an archway dividing them. The first room has a King sized bed with antique bed frame. The second room has a Queen sized bed with antique bed frame. 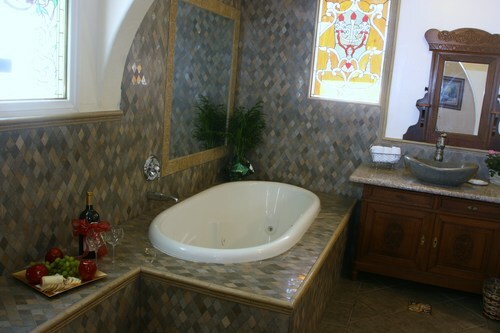 Tile surrounded jacuzzi tub with inlay mirrors. Antique oak vanity with marble countertop and stone basin sink. Seperate bathroom with tub and shower. Antique oak wet bar with marble countertop and additional sink. Private patio with french doors leading out to it. Beautiful stained glass windows, one in each room. Stunning views of Ojai and surrounding mountains from patio. Fireplace with hearth. Mini-fridge, microwave, small coffee pot and steam iron. LCD flat screen TV with digital cable and HBO. Carpet and tile floors. Easy second floor access.